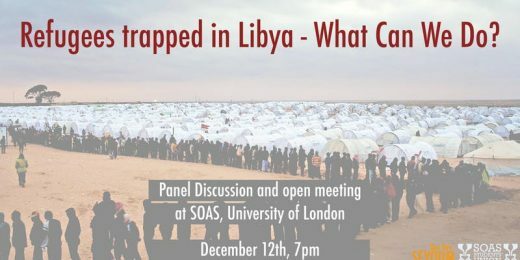 Our Giulia Tranchina has been invited to talk at the Panel Discussion and open meeting “Refugees Trapped in Libya: What Can We Do” organised at the School of Oriental and African Studies by One Day Seyoum and SOAS Students’ Union. Ten of thousands of refugees and migrants are currently detained in Libya in horrific conditions. They are routinely abused, tortured, raped and sold as slaves. EU governments are cooperating with Libyan authorities to make sure refugees are caught at sea and pushed back to Libya, whilst failing to pledge sufficient places to support UNHCR’ program to evacuate refugees out of Libya. The conference represents an opportunity to access, share and circulate crucial information and evidence about current policies affecting refugees in Libya, as well as connecting organisations and professionals involved in the legal and humanitarian sectors, with an aim of promoting a campaign to address these human rights violations and promote potential responses. The Panel will include Matteo de Bellis, Researcher on migration and asylum at Amnesty International, Sally Hayden, Freelance journalist reporting on migration, and humanitarian crises across Europe, Africa and the Middle East, Sara Creta, Visual journalist recently in Libya to document the situation in the detention centres in Libya, our Giulia Tranchina , who has campaigned extensively on behalf of migrants detained in Libya and has represented several refugees who survived atrocities there, and Sham Harif, Philosophy graduate actively advocating for the evacuation and relocation of refugees in Libya. The event’s details are available here. If you require any further information on any of the issues raised in this conference please contact Giulia Tranchina at Wilson Solicitors LLP 697 High Road, Tottenham, London, N17 8AD by g.tranchina@wilsonllp.co.uk or 0208 885 7914.